This property management agreement is for the engagement of a professional commercial property management firm for a suburban office building. The property is owned by a developer and an investor as members of the limited liability company holding title to the property. The manager engaged by the agreement is an affiliate of the developer member. 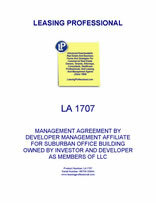 THIS PROPERTY MANAGEMENT AND LEASING AGREEMENT ("Agreement") dated _______, 20__, is between ______________ ("Owner"), whose principal offices are located ____________________________________________________________, and AGREEABLE MANAGEMENT GROUP, INC., a ____________ corporation ("Manager"), whose principal office is located at ___________________________. A. On the date hereof, Property Owner LLC (the "LLC" or "Owner") owns all right, title and interest in Owner, the owner of the ground lessee's interest in the building commonly known as _______________________________________ (the "Property"). B. Pursuant to the Operating Agreement of the LLC (the "Operating Agreement"), one hundred percent (100%) of the beneficial membership interests of the LLC are held by Agreeable Property Developer, a _________ limited liability company, whose address is _________________________________, together with its permitted successors and assigns under the Operating Agreement, "DEVELOPER or AGREEABLE" and REAL ESTATE INVESTOR, a _________ limited liability company, whose principal office is located at __________________________________, together with its permitted successors and assigns under the Operating Agreement, "INVESTOR". DEVELOPER and INVESTOR shall hereinafter be collectively referred to as the "Members". C. Owner desires to retain Manager as exclusive manager and leasing agent for the Property, and Manager desires to serve as exclusive manager and leasing agent for the Property, all upon the terms and conditions set forth below. D. All capitalized terms not otherwise defined herein shall have the meanings ascribed to such terms in the Operating Agreement, or in Exhibit I attached hereto, as the case may be. I. Appointment. Owner hereby appoints Manager, and Manager hereby accepts appointment, on the terms and conditions hereinafter set forth, as sole and exclusive leasing and management agent for the Property. Manager shall manage the Property in accordance with the Operating Standard and the Business Plan. "Operating Standard" shall mean the management of the Property in an efficient, prudent and economic manner, consistent with (A) its existing character, condition and level of operation and maintenance (subject to reasonable wear and tear) as a first-class suburban office building, (B) the manner in which Manager historically has conducted and, as of the date hereof, conducts the management of the Property and (C) then current prudent business and management practices applicable to the operation and maintenance of first-class suburban office buildings in the suburban marketplace in the state in which the Property is located of similar size, character and location. Both Manager and Owner agree to use all commercially reasonable efforts subject to the Business Plan to maintain the Operating Standard with respect to the Property. II. Term. The term of this Agreement shall commence on the date hereof and terminate upon the first to occur of the events specified in Section VIII. III. Services To Be Performed By Manager. Manager shall provide the following services for Owner, all of which shall be performed in a manner consistent with the Operating Standard and the Business Plan, subject to the specific provisions of this Agreement, including the limitations with respect to expenditures of funds (as set forth in Section III(B)(ii)) and the availability of funds. (A) Collecting Rents and Enforcing Obligations. Manager shall make diligent efforts to collect all rents and other sums due from (i) tenants of the Property; (ii) users of any garage or other parking space in or on the Property; (iii) concessionaires in connection with their authorized operation of facilities on or in the Property, and (iv) all others from whom rents or other sums are due to Owner with respect to the Property in the ordinary course of business. Owner authorizes Manager to request, demand, collect, receive and give receipt for all such rents and other charges in the name of and on behalf of Owner. All funds collected by Manager shall be deposited promptly into the Bank Account. Manager shall bill tenants of the Property on a monthly basis. Furthermore, subject to Owner's prior written consent and provided the same is consistent with the Operating Standard, the Manager shall, in Owner's name and at Owner's expense, (a) give notices to terminate leases at the Property by reason of the default of the tenants thereunder; (b) institute and prosecute legal actions relating to such leases; (c) evict tenants and recover possession of the portions of the Property occupied by such tenants; (d) sue for and recover rents and other sums due Owner and (e) settle, compromise and release such actions or suits or reinstate such tenancies. Manager is hereby authorized on behalf of Owner to retain approved counsel, collection agents and other such professionals to assist Manager in connection with the foregoing obligations. Notwithstanding the foregoing, Manager shall not enter into any Lease or any modification, amendment, shortening of the term, surrender or termination of any Lease, it being understood that all of the foregoing may be executed only by Owner. (i) Power to Disburse. Owner shall be responsible for providing funds for the Bank Account or causing funds to be so provided to meet on a timely basis the cash requirements of Manager for the proper operation of the Property pursuant to this Agreement. Manager shall be a signatory on the Bank Account and as such shall have the power, and is hereby authorized and directed, to disburse or cause to be disbursed from the Bank Account any amounts either payable to third parties or to Manager in accordance with this Agreement. (ii) Limitation on Disbursements. Manager shall not disburse any sum in connection with the operation, maintenance or repair of the Property, whether such expenditures are operating or capital expenditures, except (a) as permitted under the Business Plan; (b) if such cost is incurred in connection with a Necessary Expense; (c) expenditures in connection with providing additional services to tenants for which Owner or Manager is entitled to be reimbursed by such tenant or (d) with the prior written consent or approval of Owner. (iii) No Obligation to Advance. Manager shall not be required to make any advance to or for the account of Owner, or to pay any amount, except out of funds held by Manager in the Bank Account for the account of Owner or provided by Owner as aforesaid; nor shall Manager be required to incur any obligation to third parties unless Owner shall furnish Manager with necessary funds for the discharge thereof. Subject to the provisions of paragraph (ii) above, if the Bank Account has insufficient funds to permit Manager's proper and timely performance of its obligations under this Agreement, Manager shall notify Owner of the same at least fifteen (15) Business Days (or seven (7) Business Days if required for payment of Necessary Expenses), but not more than forty five (45) days, prior to the need for such funds and, on or before such date, Owner shall deposit such amount in the Bank Account to enable Manager to pay expenses in accordance with this Agreement. (iv) Remainder Remitted to Owner. After paying the expenses of the Property as set forth herein and maintaining a sufficient reserve as determined by Manager, but at no time less than $10,000.00 ("Property Level Reserves"), for the timely payment of future expenses, taking into account anticipated revenues and expenses, Manager shall remit to Owner the remainder of the rents and other sums collected hereunder from time to time as directed by Owner, but in no event later than the 24th day of each month for the preceding month. (c) general accounting and reporting services as such services are performed by Manager required to fulfill Manager's accounting and reporting obligations under this Agreement, including, but not limited to, cost of electronic data processing equipment or cost of data processing provided by third party data processing companies. (C) Property Management/Leasing Office. If Owner does not currently maintain a property management/leasing office in the Property, Owner may make available up to _______ square feet of space in the Property for a property management/leasing office, which office the Building Manager (or other appropriate employee of Manager) shall use solely to perform the duties set forth in this Agreement. Owner may determine the size and location of such office and Manager shall not pay any rent or other charges by reason of such office. The cost of remodeling the space, and the cost (or rental) of furniture, furnishings, fixtures and equipment, including but not limited to, personal computers, to be placed in such office, shall be paid for by Owner as an operating expense of the Property in accordance with the Business Plan and shall at all times be, and remain, the property of the Owner. Notwithstanding the foregoing, Manager may continue to use any portion of the Property which is presently used for the operation of the Property and which is depicted on Exhibit A annexed hereto, for such purpose. (D) Preparing the Business Plan. (i) On or before October 15, or at least 75 days before the beginning of each new Fiscal Year (hereinafter defined), Manager shall prepare and submit to Owner for its approval a proposed pro-forma business plan in preliminary draft form (the "Proposed Plan") for the promotion, operation, and maintenance of the Property in accordance with the Operating Standard taking into consideration then current market conditions (each a "Business Plan"). Each Business Plan shall consist of an operating budget (the "Operating Budget"), a capital improvements budget (the "Capital Budget" and together with the Operating Budget, the "Budgets"), and the leasing guidelines (the "Leasing Guidelines"). Each Operating Budget shall show, on a month-by-month basis, in reasonable detail, each line item of anticipated income and expense including, without limitation, amounts required to establish, maintain and/or increase Cash Reserves. Each Capital Budget shall show, in reasonable detail, anticipated expenditures and cost of completion for Capital Improvements with respect to each Property or portion thereof (exclusive of CM Fees or construction oversight fees payable to ACG under Sections III(E)(ii)(a) or (b)). The Leasing Guidelines for the Property shall specify net average effective rent over the term of the Lease, on a space-by-space basis, taking into account Base Rent, the term of the Lease, leasing commissions (including overrides to Manager), tenant improvements, free rent and any other tenant concessions. Owner may give comments or seek revisions to the Proposed Plan, but its failure to do so shall not prejudice its right to do so with respect to the Revised Plan (as hereinafter defined). Manager shall submit to Owner, within 15 days after the delivery to Owner of the Proposed Plan, but no later than November 1, the Proposed Plan in definitive form (the "Revised Plan"). Within 15 days from delivery of the Revised Plan, but no later than November 15, Owner shall submit to Manager any comments or proposed revisions to the Revised Plan. Manager shall submit to Owner, within 15 days thereafter, but no later than December 1, the final Business Plan incorporating Owner's comments and revisions (the "Final Plan"). Owner shall approve or disapprove the Final Plan, within 15 days after receipt thereof, but no later than December 15, which as so approved shall constitute the "Business Plan". Owner acknowledges and agrees that the Business Plan is only an estimate and not a guaranty by Manager and there may be substantial variations between the estimates set forth in the Business Plan and the actual results. The parties acknowledge and agree that the Business Plan for the current Fiscal Year is annexed hereto as Exhibit B and that such Exhibit will serve as the form of the Business Plan for all subsequent Fiscal Years during the term of this Agreement. (ii) During any Fiscal Year when Owner has failed to approve any portion of the Business Plan for any Property prior to the commencement of the Fiscal Year to which such Business Plan relates, the Property shall be operated during such Fiscal Year (A) in accordance with such portions of such Business Plan as to which agreement has been reached, (B) at rates or levels of expenditures as are actually charged or incurred with respect to Necessary Expenses and (C) with respect to those portions of such Business Plan which are discretionary and as to which agreement has not been reached at rates or levels of expenditures in the approved Business Plan for the preceding Fiscal Year, (x) increased by the CPI Increase (computed for this purpose from the January 1st of the last Fiscal Year for which a Business Plan was approved to December 31st of the Fiscal Year immediately preceding the Fiscal Year to which the Business Plan in dispute relates) and (y) increased or decreased to reflect increases or decreases in the percentage of the Property occupied by tenants since the last Fiscal Year for which a Business Plan was approved (but only to the extent the Owner reasonably determines that such increases or decreases are reasonably related to the level of the Property's occupancy). Unless Manager is otherwise notified by Owner, the fiscal year of the Property (the "Fiscal Year") shall be from the first (1st) day of January of each year, to and including the last day of December of such year except that the current Fiscal Year shall be from the date hereof through December 31, 20__. The Fiscal Year may not be changed without the express prior written approval of Owner. Manager shall be entitled to pay all LLC Charges as and when due to the extent such LLC Charges are either consistent with the Business Plan, are Necessary Expenses or if inconsistent with the applicable Business Plan, do not exceed the budgeted line item cost in the Operating Budget and Capital Budget by more than 10% or increase the Budgets by more than 7% (exclusive of increases attributable to temporary timing differences arising in the ordinary course of business), provided that Manager will act prudently and in the best economic interest of Owner in incurring Necessary Expenses. Owner and Manager shall review the Business Plan on a quarterly basis and, in connection therewith, Manager shall prepare and submit for Owner's review any proposed modifications to the Business Plan. Following any modification approved by Owner, the "Business Plan" shall be the original Business Plan as so modified. (iii) Monthly and Quarterly Reports. During the term of this Agreement, Manager shall render to Owner a monthly (and year to date) written report (the "Monthly Report"), containing the information and in the form set forth on Exhibit C for the immediately preceding calendar month. During the term of this Agreement, Manager shall render to Owner a written quarterly report (the "Quarterly Report") containing the information and in the form set forth on Exhibit D for the immediately preceding quarter. Manager shall prepare all financial statements that are a part of the Monthly and Quarterly Reports on an accrual basis in accordance with GAAP. Owner, at its election, may inspect Manager's books and records with respect to the Property and Owner and may review and make copies of invoices, bills or other supporting data in connection with a Monthly or Quarterly Report. Manager shall provide itemization of and supporting data for any sums retained by or claimed to be due to Manager as a Management Fee (hereinafter defined), Leasing Commission (hereinafter defined), or otherwise. (E) Making Contracts for the Property. (i) Manager, as agent for Owner, shall enter into contracts (payable at Owner's sole cost and expense) or otherwise arrange for fuel, oil, vermin extermination, janitorial service, trash removal, snow removal and other necessary services (each, a "Contract") as shall be consistent with the Operating Standard and the Business Plan. Unless otherwise approved in writing by Owner, all contracts shall be terminable by Manager or Owner upon thirty (30) days notice. Manager shall also be authorized on behalf of Owner to place orders in Manager's or Owner's name for such equipment, tools, appliances, materials and supplies ("Personal Property") as are necessary to maintain the Property in a matter consistent with the Operating Standard and the Business Plan. Owner hereby acknowledges and agrees that the Contracts executed prior to the date hereof and set forth on Exhibit E annexed hereto (the "Existing Contracts") are hereby approved in all respects. (ii) (a) Subject to the provisions of paragraph (b) below, so long as Agreeable Construction Group, Inc. (or any successor or affiliate thereof) ("ACG") remains an affiliate of Manager, Owner hereby authorizes Manager to utilize ACG to provide construction management services ("CM Services") for tenant improvements and capital improvement projects at the Property (each particular tenant improvement or capital improvement project, a "Construction Project" and the CM Services for a Construction Project a "CM Service"). Subject to Owner's prior approval, ACG shall be reimbursed by Owner for all costs actually paid to third parties by ACG in connection with the Construction Project at the Property. If ACG shall perform the CM Services (and another Qualified Bidder was not engaged to perform such CM Services pursuant to clause (b) below), ACG shall receive a fee for the CM Services in an amount equal to six percent (6%) (the "CM Fee") of all costs, except for the cost of the CM Fee or other amounts in the nature of a fee paid to ACG, actually paid to third parties under each contract for a particular tenant improvement or capital improvement (the "Total Project Cost"). CM Services do not include and no CM Fee shall be paid to ACG for a Construction Project for which Manager determines no contract was required or which costs less than $10,000.00. (b) If a particular Construction Project (other than a Construction Project which is necessary (and so limited in scope) to remediate an emergency condition (an "Emergency Project")) is not specified in the then approved Business Plan or if INVESTOR has not otherwise received written notice of a Construction Project, Manager shall give written notice to Owner and INVESTOR at least sixty (60) days prior to the commencement of such Construction Project or such shorter notice as may be practicable under the circumstances. Notwithstanding the provisions of (a) above, INVESTOR may, on behalf of Owner, by notice given to Manager at least thirty (30) days prior to the commencement of a particular Construction Project (or if INVESTOR was given less than 60 days' notice, then within 15 days after such notice was given), elect not to permit ACG to perform CM Services for that particular Construction Project; provided, however, INVESTOR may not make such election with respect to an Emergency Project. In the event Owner does not approve ACG's performance of CM Services for the Construction Project pursuant to the foregoing sentence, Owner shall retain a general contractor to perform such Construction Project by (x) bidding out the Construction Project to at least three (3) (or, if ACG is not one of the bidders, to less than three (3) if Manager does not deem three (3) to be practicable) general contractors who are reputable and have reasonable financial strength, and such bidders may include ACG (each a "Qualified Bidder") and (y) awarding such Construction Project to ACG or to another Qualified Bidder as Owner, may determine in its sole and absolute discretion, provided however, that the bid shall not be awarded to ACG without the prior consent of INVESTOR (the "Successful Contractor"). Manager shall retain ACG to oversee the Successful Contractor's Construction Project, for which ACG shall be paid a construction oversight fee equal to 2% of all costs (except for the cost of paying such construction oversight fees or other amounts in the nature of a fee paid to ACG) actually paid for the Construction Project. (c) So long as ACG remains an affiliate of Manager, Owner hereby authorizes Manager to utilize ACG to provide architectural and engineering services ("A&E Services") to the Property (each, an "A&E Project") provided such A&E Services are (1) of satisfactory quality, (2) provided at no higher than the then current market rates and (3) in accordance with the applicable Business Plan to the extent the A&E Services are scheduled to commence on or after the beginning of the 20__ Fiscal Year. Subject to Owner's approval, ACG shall be reimbursed by Owner for all costs actually paid to third parties by ACG in connection with an A&E Project. Notwithstanding the foregoing, if the A&E Service to be provided by ACG with respect to a particular A&E Project is estimated to exceed $50,000.00, which amount shall be adjusted annually by the CPI Fraction, then Owner shall (x) bid out such A&E Project to at least three (3) (or, if ACG is not one of the bidders, to less than three (3) bidders if Manager does not deem three (3) to be practicable) qualified third parties who are reputable and have reasonable financial strength and such bidders may include ACG (each a "Qualified A&E Bidder") and (y) award such A&E Project to ACG or another Qualified A&E Bidder as Owner may determine in its sole and absolute discretion, provided however, that the bid shall not be awarded to ACG without the prior consent of INVESTOR.